At Universal Orlando Resort, safety is a top priority. While the attractions have been designed so that the maximum number of guests can enjoy them, please be aware that many attractions have restrictions and guidelines to make sure guests have a safe, enjoyable experience. They include language about the nature and dynamics of the experience, as well as guest height, medical conditions or other factors that should be considered before riding. 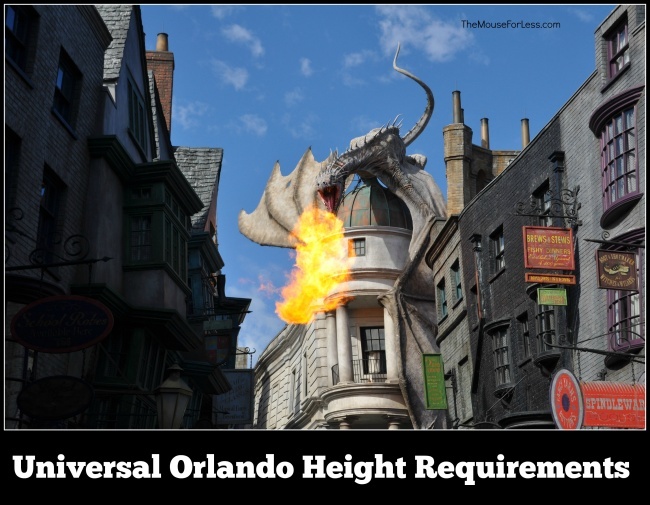 Please take note of Universal Orlando height requirements, guidelines and restrictions before riding. To assist you in planning your visit, we have provided a list of attractions with restrictions and height requirements for Universal Studios Florida and Universal’s Islands of Adventure theme parks. Fast & Furious – Supercharged – Must be at least 40″ (102cm). Children between 40″ – 48″ (102cm – 122cm) must be accompanied by a Supervising Companion. *Harry Potter and the Escape from Gringotts – Must be at least 42″ (107cm). Children between 42″ – 48″ (107cm – 122cm) must be accompanied by a Supervising Companion. *Revenge of the Mummy – Must be at least 48″ (122cm). Men in Black: Alien Attack – Must be at least 42″ (107cm). Children between 42″-48″ (107cm – 122cm) must be accompanied by a Supervising Companion. Woody Woodpecker’s Nuthouse Coaster – Must be at least 36″ (91cm). Children between 36″-48″ (91cm – 122cm) must be accompanied by a Supervising Companion. The Simpsons Ride – Must be at least 40″ (102cm). Children between 40″-48″ (102cm – 122cm) must be accompanied by a Supervising Companion. *Hollywood Rip Ride Rockit – Must be at least 51″ (130cm) and no more than 79″ (200cm). E.T. Adventure – Must be at least 34″ (86cm). Children between 34″-48″ (86cm – 122cm) must be accompanied by a Supervising Companion. Despicable Me Minion Mayhem – Must be at least 40″ (102cm). Children between 40″- 48″ (102cm – 122cm) must be accompanied by a Supervising Companion. Persons under 40″ (102cm) must experience this attraction from an adjacent stationary seat. TRANSFORMERS: The Ride-3D – Must be at least 40″ (102cm). Children between 40″-48″ (102cm – 122cm) must be accompanied by a Supervising Companion. Race Through New York Starring Jimmy Fallon – Must be at least 40″ (102cm). Children between 40″-48″ (102cm – 122cm) must be accompanied by a Supervising Companion. *These rides have “test seats” available so that guests can determine comfort and fit for themselves before riding. Jurassic Park River Adventure – Must be at least 42″ (107cm). Children between 42″-48″ (107cm – 122cm) must be accompanied by a Supervising Companion. Pteranodon Flyers – Please note that Pteranodon Flyers is designed for children 36″ – 56″ inches tall (91cm – 142cm). A child meeting this requirement must accompany guests over 56” inches tall (142cm). Children between 36″-48″ (91cm – 122cm) must be accompanied by a Supervising Companion. *Dudley Do-Right’s Ripsaw Falls – Must be at least 44″ (112cm). Children between 44″-48″ (112cm – 122cm) must be accompanied by a Supervising Companion. Popeye & Bluto’s Bilge-Rat Barges – Must be at least 42″ (107cm); between 42″-48″ (107cm – 122cm) must be accompanied by a Supervising Companion. *Incredible Hulk Coaster – Must be at least 54″ (137cm). The Amazing Adventures of Spider-Man – Must be at least 40″ (102cm). Children between 40″-48″ (102cm – 122cm) must be accompanied by a Supervising Companion. *Doctor Doom’s Fearfall – Must be at least 52″ (132cm). The High in the Sky Seuss Trolley Train Ride! – Must be at least 40″ (102cm). Children between 40″-48″ (102cm – 122cm) must be accompanied by a Supervising Companion. *Harry Potter and the Forbidden Journey – Must be 48″ (122cm). Flight of the Hippogriff – Must be at least 36″ (91cm). Children between 36″-48″ (91cm – 122cm) must be accompanied by a Supervising Companion. Cat in the Hat – Must be at least 36″ (91cm). Children between 36″-48″ (91cm – 122cm) must be accompanied by a Supervising Companion. Skull Island Reign of Kong – Must be at least 36″ (91cm). Children between 36″ – 48″ (91cm – 122cm) must be accompanied by a supervising companion. Honu of Honu ika Moana – Must be 48″ (122cm). Ika of Honu ika Moana – Must be at least 42″ (107cm). Guests 42″ – 48″ (107cm – 122cm) must be accompanied by a supervising companion. Krakatau Aqua Coaster – Must be at least 42″ (107cm). Children 42″- 48″ (107cm – 122cm) must be accompanied by a supervising companion. Maku Puihi Round Raft Rides – Must be at least 42″ (107cm). Children 42″ – 48″ (107cm – 122cm) must be accompanied by a supervising companion. Ohyah & Ohno Drop Slides – Must be at least 48″ (122cm). Punga Racers – Must be at least 42″ (107cm). Children between 42″ – 48″ (107cm – 122cm) must be accompanied by a supervising companion. The Reef – Children under 48″ (122cm) must wear a U.S. Coast Guard approved life vest. Runamukka Reef – Maximum 54″ (137cm). Taniwha Tubes – Must be 42″ (107cm). Children between 42″ – 48″ (107cm – 122cm) must be accompanied by a supervising companion. TeAwa The Fearless River – Must be at least 42″ (107cm) . Children between 42″ – 48″ (107cm – 122cm) must wear a U.S. Coast Guard approved life vest and have a supervising companion to enter. Waturi Beach – Children under 48″ (122cm) must wear a U.S. Coast Guard approved life vest. Lockers are available within each of the theme parks for guest rental for $8.00 per day, with family size lockers available at Universal Studios Florida for $10.00 per day. Guests have unlimited access to these lockers during the course of the day. Additional lockers are available at Universal’s Islands of Adventure for $2.00 per hour, with a $14.00 per day maximum. NOTE: The lockers at the Incredible Hulk Coaster, MEN IN BLACK Alien Attack, Harry Potter and the Forbidden Journey, Revenge of the Mummy and Hollywood Rip Ride Rockit are free for at least the first 45 minutes (time may vary – check with the individual attractions for specific length of time).